Designed with special cutting impeller made of SS hardened material with highly sharpened knife edges for cutting small flexible solid particles prior to being passed to the impeller. The pump is designed for Grey water transfer, sump emptying, septic effluent, pumping of waste water with soft solid in suspension, hard dirt, rubber materials, resin and plastic. These Grey water cutter pumps deliver energy of motion to slurry solids surrounding the pump intake, re-suspending them into a fluid state. These solids, which would have been otherwise buried and starved the pump of liquid, are pulled into the pump and pushed on through the discharge keeping the intake clear and free of slurry accumulation. Suitable for pumping sewage, municipal and industrial wastes comprising long fibrous constituents ,feces etc., PCE pumps are fitted with external macerators for chopping, mixing and pumping mediums containing hair, straw, bones, fat, long plant fibers. 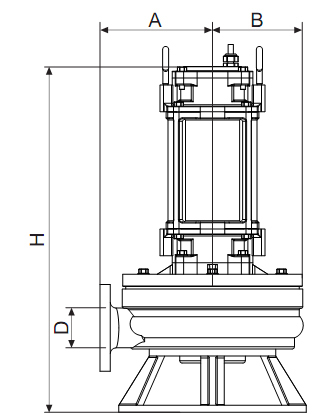 The cutter system is separated from the pump casing and impeller. The cutting action takes place before the medium enters the pump there by preventing the blockage in the pump and the system that follows. The motor is protected with two mechanical seals and is fitted with a permanently lubricated ball bearing.